Crossover, as the word suggests means something crossing something else. In this case it could be any of the following, but not limited to the same. But these are the most commonly used ones in this context. Stock Price(Closing) crossing a Moving Average. Up or Down. One Moving Average crossing another. Up or Down. MACD slow line crossing fast line. Up or Down. MACD slow or Fast line crossing 0 line. Up or Down. Late Jan 2005: MACD Bullish crossover. What does this mean. The Fast line(Green) crossed the Slow Line(Red) and moved up. Also Stock Price(Closing) Crossed both, 10 and 50 DMA. This means the stock is headed up in the immediate short term. Because there seems to be lot of buying interest. 15% profit in less than 10 days. Early Feb 2005: DMA Bullish crossover. 10 day Simple Moving Average crossed the 50 day Simple Moving Average and was moving up. In this particular case, it was more of a false alarm as the stock did Not move a lot after this. Late Feb 2005: MACD Bullish crossover. MACD Fast line crossed the slow line moving up. Stock price too crossed both, 10 and 50 DMA. About 12% profit in less than a weeks time. Early March 2005: MACD Bearish Crossover. 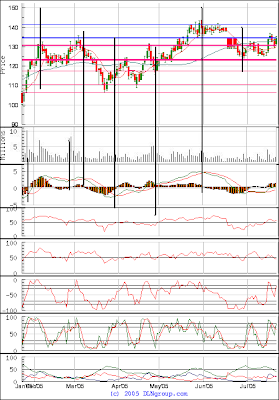 MACD Fast line crossed the slow line moving down. Stock price too crossed the 10 DMA. A neat 19% profit in just about 2 weeks time. Late March 2005: MACD Bullish crossover. Price also crossed 10 DMA. 13% profit in just about a months time. If you closed the position. Late April 2005: MACD Bullish crossover above 0 Line. This is an excellent Buying point. Of course, if you did Not sell your position from above, then this confirms your long position stance. MACD, both lines crossed 0. Very very Bullish. Stock Price Crossed both 10 and 50 DMA. 10 DMA crossed 50 DMA and moved up. Perfect example of an Extremely bullish situation getting so many confirmations. Neat 18% profit in just about a months time. Late May 2005: MACD Bearish crossover. Confirmed with stock price crossing below the 10 DMA. Just over 13% profit again, in less than a months time. Late June 2005: MACD Bullish Crossover. Confirmed with 10 dma crossing above 50 dma. Stock mostly flat with just over 10% profit in about a months time. Crossovers, as with any other technical indicator works well only if you have confirmations from more than one technical indicator. As you can see in our last(Late April 2005) example, we got confirmations from so many places. An excellent buy point. Made an easy 18%+ profit in just a months time. Again, please note. Though it may seem so simple, it may not be as simple while you are trading or getting into a trade. It takes patience and practice before you start utilizing all of these powerful tools to trade in the positive territory. So to Conclude. Crossovers really give great buy/sell signals. More so when you combine them with other crossovers or price movements. If you get confirmations from additional technical indicators, other than crossovers, then it adds value to your decisions.